Today's guest post is from a super chef, a health freak who never stopped surprising us with her beautiful dishes stuffed with healthy ingredients in it.Yes my today's guest is none other than Swasthi of Indian Healthy Recipes aka Swasthi's Recipes.Swasthi, her blog speaks a lot about her passion for her healthy cooking and blogging.She shares many South Indian dishes with stepwise pictures and none will go wrong with her instructions. I have became an ardent fan of her way of cooking with healthy stuffs,traditional foods and wonderful eggless,sugarless bakes. Seriously if you go through her space, am sure you will definitely fallen in love with her space.Good friends are very rare, but believe me even this virtual world brings you many wonderful friends, trust me apart from few, most of the bloggers i crossed in this virtual world are genuine,down to earth with huge heart.One among those wonderful bloggers i have crossed in this immense virtual world is Swasthi,i have to say a big thanks to her for giving me this incredible guest post and loved it. Lets hear from Swasthi of Indian Healthy Recipes..
Iam Swasthi, a home maker by choice living in Singapore with my kids and hubby. I started blogging as Swasthi, The Health Freak in April 2012. After 5 months, I moved my blog from BlogSpot to Indianhealthyrecipes.com. Life has been more cheerful than before since I get connected virtually with many impressive people across the globe. Next best thing is I get more ideas to cook healthy and my kids understand a lot about healthy eating ever since I turned a food blogger. Years ago when we moved to Singapore, I was new to cooking and was looking for recipes on the web. I could find very few recipes that matched my taste like using less oil or no ghee, no refined flours, no refined sugars and no food colors. Then I stopped searching and then began to cook on my own with the help of a hand written book from my chef in Bangalore. So I thought of blogging all my ideas and recipes that could help health freaks like me. Clear instructions with step by step pictures. I develop healthy recipes, while trying to eliminate high fat content, refined foods, food colors and ingredients like ajinomotto where ever possible. Sanjay Thumma, popularly known as Vahchef and Sanjeev Kapoor from whom I have learnt easy cooking. Firstly, like most other bloggers, I too had to fight plagiarism. I have learnt a lot, being vigilant and regularly checking if my content has been duplicated elsewhere and to bring down the stolen content are some of the steps I follow. Secondly, Iam a very shy natured person and not very social. To excel as a food blogger one needs to open up their heart and write, make friends virtually and interact with their readers, this is something I need to learn. I think iam not the right person to share any tips. Hehe! My pics are terrible. I don’t even know to use my DSLR properly, in spite of owning it for years. I just click many shots and luckily few of them turn out to be good. My best to the worst pictures on my blog have been shot the same way. I use whatever I have in my house. Sometimes, I use my son’s art and craft sheets or stuff. I try to publish 2 to 3 posts in a week. I love to read, read and read. I enjoy reading all kinds of stuff on the web. Iam very happy to be here as a guest on Priya’s blog, one of my most favorite bloggers whom I respect a lot. I absolutely adore this lovely queen for her attitude and cheerfulness. It is her attitude and virtues that brings a charm to herself. Today is a great day for me that I get to open up my heart with you all. Tons of Thanks Dear Priya, for consistently supporting me from my early days of blogging. 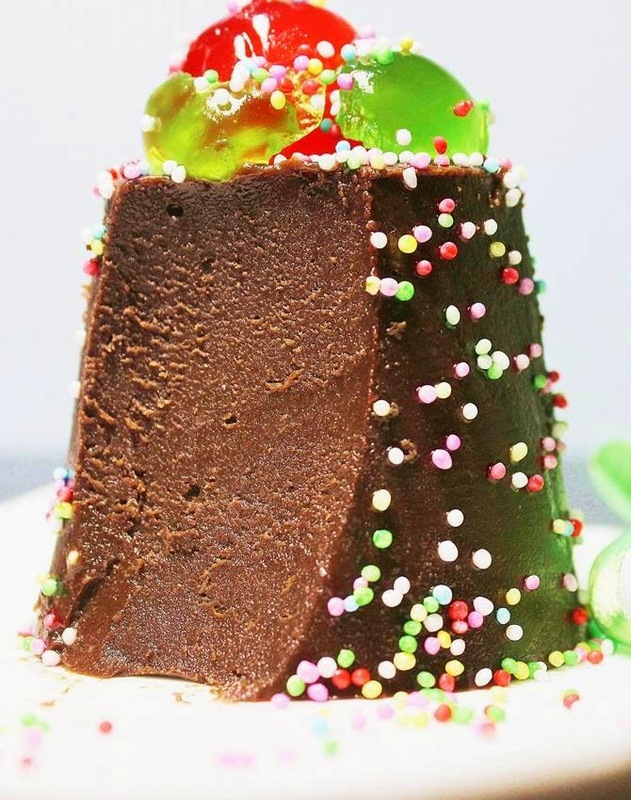 I made this chocolate pannacotta to share with you all today. 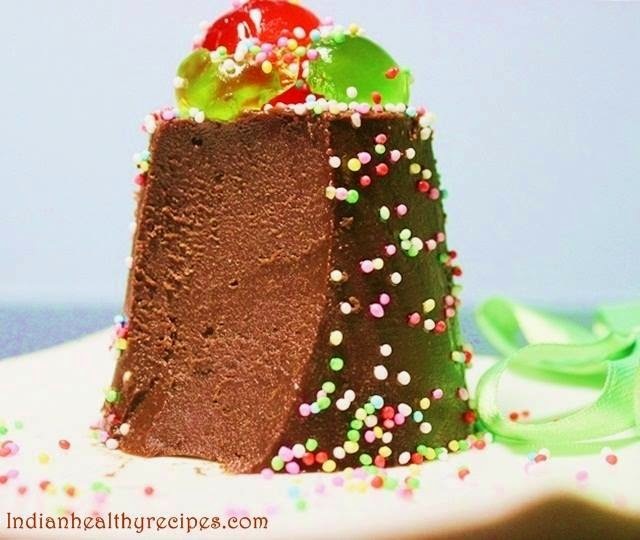 This recipe yields an yummy dessert that can be prepared in a jiffy and the setting time is only 30 minutes and can set even without refrigeration. 3. Add sugar, vanilla and cream. 5. Add the chocolate and whisk it till the chocolate melts thoroughly. 6. i passed the mix through a strainer before transferring to the molds to remove any particles that have not melted well. But you must be quick as the mix thickens quickly. 7. Pour the mix to molds. These need less than 30 mins to set. Keep the molds in warm water and then run a knife around and tap it on a serving plate. Hope you all enjoyed this wonderful guest post, stay tuned for an another post from an another blogger. Wonderful Chocolate pannacota. Nice guest post with attractive photos. Such a wonderful post! I am so glad to know more about Swasthi and love her healthy recipes, and her photography. Thank you Priya for hosting this event! Glad to know about Swasthi and the pannacotta looks wonderful. Very nice guest post dearies. Enjoyed reading. Panacotta looks delicious. nicely done swasthi.colorful pics .kudos to both of you . MAria, you can add 1tsp of Gelatin powder to replace the agar agar powder.Hope this helps. 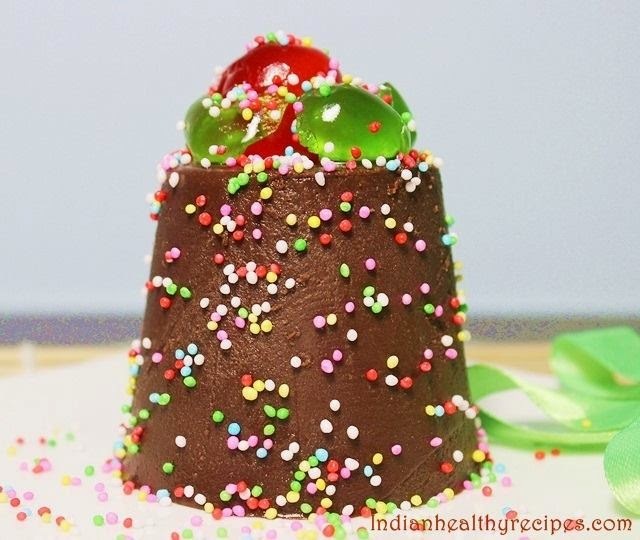 @ezhil ashok Since its a pannacotta, You should add agar agar powder or flakes to make this, else if you have gelatin powder add it, so that your dish wont melts.